La Belgique organise la premiere Coupe du Monde Veterans a Mons. Mons est idealement situe, non loin de la frontiere francaise, le long de l’autoroute E42. Donc d'un acces rapide et aise pour nos amis francais. 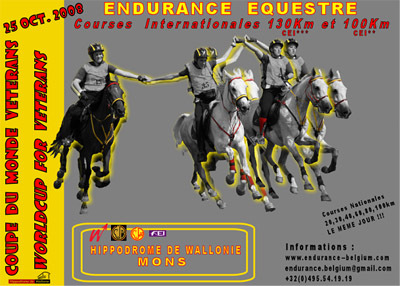 Belgium organizes the first Endurance WorldCup for Veterans in Mons. The city of Mons is ideally located near the French border, along the E42 motorway. Le nouvel Hippodrome de Wallonie accueillera l'evenement. De superbes installations pour recevoir au mieux les chevaux, les cavaliers et les suiveurs. Pour le logement, pas de soucis car il existe de nombreux hotels, gites ou chambres d'hotes pour toutes les bourses. The new " Wallonia Racetrack " will be the venue of the event. This is a superb venue to welcome at its best horses, riders and crew members, as well as spectators. As far as accommodation is concerned, no problem at all as there are many hotels, B&B or others for all budgets. - The WorldCup for Veterans (OPEN) – one CEI*** on the distance of 130km which also includes an OPEN ranking. All riders are entitled to participate. The riders aged more than 45years are competing for the WorldCup, the others will make part of the Open ranking. Nous tentons de mettre sur pied un systeme d'echange de chevaux entre cavaliers proches (Belges/Francais/Allemands/Hollandais) et des cavaliers nettement plus eloignes, venant notamment d'autres continents. Nous ferons l'interface entre les offres et les demandes en essayant de trouver les meilleures combinaisons possibles. Donc n'hesitez pas a nous contacter pour nous faire votre proposition. We are trying to set up a system for a free leasing between riders from the neighborhoods (Belgium/France/Germany/Holland) and overseas riders. We will be keen to provide an interface between the offers and the requests, trying to find the best combinations. Don’t hesitate to contact us to propose your deal.